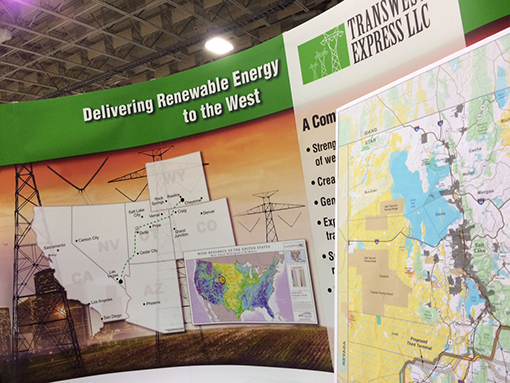 May 26, 2015 — With the TransWest Express Transmission Project's federal environmental analysis now largely complete, more visitors reviewed the TWE Project exhibit at the 2015 Utah Governor's Energy Development Summit than ever before. 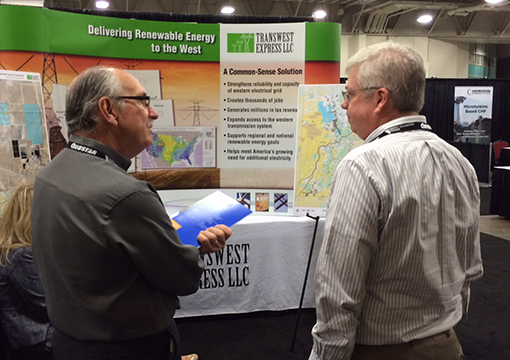 Attendees at the fourth annual summit — which has been sponsored by TransWest Express LLC all four years — continually conversed with company representatives throughout the May 20-21 event. Among other questions, people asked about the jobs and economic benefits this electricity transmission project will provide, how to potentially participate in the construction process, and where the Bureau of Land Management and Western Area Power Administration have determined the TWE Project is best sited, after more than six years of environmental analysis, public input and collaboration among 50 federal, state and local cooperating agencies. 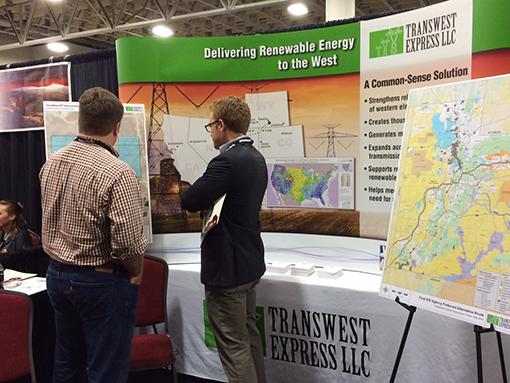 Participants also expressed strong support for TransWest's planned multimillion-dollar investments in Utah's energy sector. According to the Utah Office of Energy Development, the event's presenter, the summit is the largest state-hosted energy conference in the West, expected to attract 1,500 attendees from around the globe. Participants include energy industry professionals, NGO representatives, government officials, scientists, academics, students and the general public. In addition to the exhibit area with more than 100 displays, the summit features plenary keynotes, panels and break-out sessions on a range of important energy and environmental issues. Utah Governor Gary R. Herbert and Colorado Governor John Hickenlooper were among the key speakers, and TransWest Director of Engineering David Smith participated in a panel about grid flexibility and reliability. The TWE Project is a 3,000 MW direct current transmission line to deliver renewable energy between the Desert Southwest and Rocky Mountain regions while increasing the reliability and capacity of the western power grid. It is designed to provide for a potential interconnection at the Intermountain Power Plant and its transmission system in Millard County, Utah. BLM and Western were the joint lead federal agencies that prepared the project's Final Environmental Impact Statement, which was published on April 30, 2015.